Bmillions is a great one-stop shop for online lottery, but my overall experience was mixed. Bmillions is a hybrid lottery site which means they both purchase tickets on your behalf and also allow you to bet on game outcomes without buying a ticket. I found that Bmillions offers a simple, easy-to-use hybrid service with some features that I really liked. Some players might find Bmillions a bit limited, though: the site focuses only on syndicate games and supports a narrow range of payment methods. At the end of the day, Bmillions is a unique lottery site. Let's dive into some of the pros and cons. Bmillions is a relatively young lottery website that’s made waves with its syndicate-focused approach. Owned and operated by Profit Ninja Ltd., Bmillions is based in Sofia, Bulgaria. It works with a hybrid business model that offers both official lottery tickets and lotto bets depending on the size of a lottery’s jackpot. Bmillions either registers your purchase as a bet on the lottery’s outcome or buys an official lottery ticket on your behalf. Which service you get depends on the size of a lottery game’s jackpot: If the jackpot is at EUR 50M or less, Bmillions uses a lotto betting system. For jackpots above EUR 50M, however, Bmillions acts as a lottery agent buying official lottery tickets. Bmillions’ business model isn’t the only unique thing about it, though. Unlike many lottery websites, Bmillions focuses solely on syndicates. You can’t play solo here. Combos: Bundles of multiple syndicates. These are a great way to save money if you want to play several lotteries. Multiple draws: When you buy shares, you can choose to participate in draws for the next 1, 3, or 6 months. Bmillions’ short registration form means you can start playing quickly. Bmillions requires a bit more information than usual, but the registration process is still pretty quick. You just need to provide your full name, country and mobile number, email address, and password. If you’re already registered, the “Login” button is at the top of the Bmillions site. Bmillions doesn’t run many promotions or offer discounts. Bmillions has a relatively limited lottery selection. Bmillions lets you play 9 lotteries from the USA, Europe, and Australia. You mostly get the big-ticket games like US Mega Millions, though there are a few smaller lotteries mixed in. There’s one glaring omission here, though: the US Powerball is nowhere to be found. It’s strange: the Powerball used to be an option here, and it’s baffling why the site seems to have dropped one of the biggest and most popular lottery games out there. Each Bmillions syndicate has a set number of total shares. You can buy 1, 2, or 5 shares ine one go. When all the shares in a syndicate have been bought, Bmillions starts a new one, so you don’t have to worry about running out. I have one quibble here: Bmillions locks you into a minimum 1-month subscription by default. There doesn’t appear to be a way to play one draw at a time. This means a single purchase at Bmillions can easily cost as much as EUR 100, especially for lotteries that have multiple draws per week. If you’re on a budget, Bmillions is not the way to go. Bmillions displays results for 14 lotteries in all. You can jump straight to Bmillions’ lottery results page from the navigation bar. You can select previous draws from the dropdown menus. You can play many of these through one of Bmillions’ Combo packages, even if they’re not available as individual syndicate options. Bmillions’ Combos deliver value-for-money game variety. If you’re eyeing several syndicates, you can save money with Bmillions’ Combo packages. You have 6 Combos to choose from — one less than Bmillions used to offer. Each Combo is a bundle of syndicates. (TheLotter offers a similar service.) Some Combos actually include lotteries that you can’t get as a standalone syndicate, like El Gordo Primitiva and Powerball Australia. You can pay €71.04 to buy 1 share of the MegaMillions syndicate, valid for 1 month’s worth of draws. Or you could pay €18.99 for 1 share in the Big 4 Combo, which gives you 1 share for EuroMillions, Mega Millions, Oz Lotto, and EuroJackpot, valid for all these lotteries’ draws for 1 week. If you’d like to spread your risk (and your chances of winning!) around, Bmillions’ Combos help you do that without breaking the bank. No, definitely not. Bmillions is run by a legitimate company, and it has airtight security measures in place to protect transactions. The site is protected by 256-bit SSL encryption, and it has a payout guarantee. Yes. Bmillions is owned and operated by Profit Ninja Ltd., a company based in Sofia, Bulgaria. Yes. Bmillions protects its website using a 256-bit SSL certificate that ensures airtight encryption for all transactions. Is Bmillions a real or fake company? Bmillions is real. It’s run by a Bulgarian company called Profit Ninja Ltd. Unlike other top sites we’ve reviewed, though, Bmillions doesn’t seem to have a license issued by a government gambling commission. Profit Ninja Ltd. owns and operates Bmillions. Profit Ninja is based in Sofia, Bulgaria. How does Bmillions make money? Bmillions doesn’t take cuts from your winnings. Instead, it funds its operations through the handling fees that are part of every purchase made on the website. Yes, Bmillions is legal. Despite the lack of a government-issued license, Bmillions operates in compliance with laws on information security, etc. Does Lottery Critic Trust Bmillions? We do. Bmillions has bank-grade 256-bit SSL encryption to protect users, so you know your account is in good hands. It would’ve been better if Bmillions had an official license, though. Bmillions has a simple payout system, though claiming bigger prizes could get complicated. Like many lottery websites, Bmillions doesn’t charge commissions for any winnings.Better still, the site guarantees that you’ll get your prize money in the shortest possible time. At Bmillions, any prize below $600 gets credited to your account. Prizes beyond $600, meanwhile, will have to be claimed in person. In these cases, you can choose to have the physical ticket delivered to you via courier. Alternatively, you can travel to the lottery operator’s country and get the ticket yourself before claiming the prize. Cashing out your winnings is as simple as sending Bmillions a request. In most cases, especially for big amounts, you’ll have to give Bmillions proof of your identity. Once your identity has been verified, you can opt to receive the money through check, wire transfer, or credit card. Bmillions offers support for a short list of payment methods. This is a bit disappointing, as some of these alternatives might not be available for many countries. That means users can get stuck with just Visa or MasterCard as payment options. For users without debit or credit cards, this could stop them from finishing their transaction entirely. Has anyone won on Bmillions? Bmillions doesn’t provide any information about past winners. Unlike many lottery websites, Bmillions doesn’t advertise its most recent winners or biggest payouts. I’m sure winners appreciate Bmillions’ discretion. Most lottery winners seem eager to keep their good fortune under wraps. Just read up on the biggest lottery winners of all time—most of them seem happy to disappear from the spotlight! Bmillions relies on a mobile-responsive website. You won’t get a dedicated mobile app here. However, you can access the Bmillions site easily on a mobile device. Bmillions offers one main support channel, with no options for urgent assistance. Bmillions used to get a lot of complaints regarding its sluggish responses. This past year, though, Bmillions has shown signs of improvement. After a rough few months, I’ve started seeing faster responses. There’s also been an uptick in the quality of responses to standard support questions. You can reach Bmillions’ support team via email or their on-site contact form. A live chat option would’ve been a good way to round out those options, especially for users who want urgent assistance. Bmillions has a barebones FAQ section, so don’t expect to find detailed help here. The FAQ only covers 7 questions, and answers are far from thorough. Maybe Bmillions just doesn’t get a lot of questions, but a more detailed FAQ would’ve been better for users who need to do DIY troubleshooting. Bmillions delivers a simple, convenient playing experience, especially for European players. Players interested in European games or group play should give Bmillions a look. Bmillions has a simple, uncluttered interface. Bmillions has given its website a fresh coat of paint. Unfortunately, some of Bmillions’ design highlights seem to have been lost in the process. The handy draw countdowns and convenient navigation bar are still there. However, lottery results have been pushed to the bottom of the homepage. One good point, though: Bmillions has also been expanding its language offerings. Initially, you could only get the Bmillions site in 4 languages: English, German, Spanish, and Swedish. Over time, though, they’ve bumped that up to 8 in all, adding Čeština, Portuguese, Suomi, and Norsk Bokmål. Non-English speaking players, especially from various parts of Europe, won’t have problems here. Of course, Europe isn’t the only continent that plays online lottery. Let’s hope Bmillions adds language support for players from Asia, Africa, and more. Bmillions’ minimum 1-month subscription for individual lotteries can be a bit of a bummer, since it drives up the price. The Combos offer a better deal for players on a budget. Whether a lone syndicate or a Combo package, though, Bmillions makes it easy for you to pick your preferred option and proceed to checkout. Bmillions works best for group play enthusiasts with deep pockets. 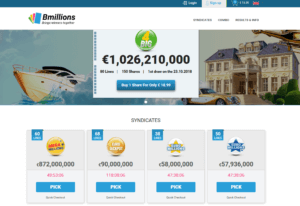 If you like syndicates, Bmillions might be the lottery site for you. Bmillions’ syndicates cover a good spread of lotteries, from popular games like EuroMillions and Mega Millions to smaller games. If you’re looking for a good bargain, Bmillions’ Combos stretch your money further while boosting your chances of winning. Plus, their zero-commission policy means you won’t have to suffer deductions from your winnings. Bmillions’ simple, mobile-optimized website delivers a pleasant user experience, too. Registration is a breeze, and you can easily make a purchase from any page on the site. Bmillions have also shown promising signs of improvement in terms of customer support. The past few months have been rough, and the comments from disgruntled users were enough to spook anyone. But Bmillions now seems to have re-committed to improving their customer service — a great turnaround. If you love group play strategies for online lottery, Bmillions is a solid option. It doesn’t offer as many games, payment methods, or even language options as other websites, but Bmillions’ focus on the group play niche makes it a unique option that’s worth trying for yourself. I won 12,000 on a scratch card and when I went to withdraw it they told me they are voiding my win as there was a malfunction!! So I never received anything!! Sorry to hear that, Ben! Sounds like a question for Bmillions’ support team. Hope you can hash out the issue with them soon. I to have tried to cancel my account through my bank,but they keep taking money off me, what do I do next ? No, they don’t continuously charge you. The main issue seems to be stemming from the money-back guarantee–which, based on what others have said, they are refusing to honor. estoy leyendo todos los comentarios y me estoy asustando,puesto que me iba registrar en Bmilions, pero despues de lo leido ya no me atrevo a registrarme, puesto que no me gustaría perder mi dinero, despues de lo leido, repito ya no me atrevo a registrarme, gracias por los comentarios. Unfortunately, the only way to cancel your account with them is by sending them a message through their support channels. Yes their head office is Bulgaria or America and going under the name profit ninja,I’m starting to think that my money has gone altogether,I will be seeing trading standards tomorrow at my council office,let’s get the ball rolling and they better give Patrick his money too on here,I feel sorry for him,he going through same as me with all this round in circles business.i will update everyone on here if trading standards can get my money back off these dreadful people. I have also contacted my banks fraud department and they are investigating them to try and get my money back. No matter how many threats I send Bmillions they don’t think they will be affected by the authorities investigating them. Fingers crossed they will get what they deserve. I have also contacted TV’s WatchDog, then the whole country will know about them. I’d be grateful if everyone contacted Trading Standards and WatchDog. The more that do the better chance of bringing them down. Hello Patrick I have received my money back,it is only a temporary payment until they find out what is going on with this company,I also reported them to action fraud and the police will more likely get involved but for now you are doing the right thing by contacting your bank,give the date of the transaction and they will refer you to your debit card dispute company,simply tell them what has gone wrong then they will put the money in for you that you requested until all investigations are done,good luck Patrick and I hope you get your money soon,this ain’t over yet,I have requested compensation also and a full response as to what steps action fraud,my bank and the police are going to take in this matter now,good day Patrick. It is still going on unfortunately,I have had numerous emails from them again about sending my identification documents in when I have already done this,then they keep asking for a reason why I want the refund and how much for,if my money is not in next week I am going to take action against these awful people,I have insisted many times for them to refund my account and I’m still having problems getting my money back. I agree totally with the above comments. Don’t waste anymore time on them. Take action, report them, contact the media, contact Trading Standards and Inland Revenue. They are a fraudulent company who have no other agenda than to steal your money to fill theirs. Do not take any notice of any good review. They no doubt wrote it themselves. Be aware they are also Profit Ninja as well. I totally agree with you Patrick,3 weeks in and I still ain’t had my £151.00,they keep going round in circles asking for documentation again,I said I have already sent them the documentation many times and they keep saying that senior management will get back to them with a decision,I am going to trading standards or even a solicitor this week,in total it has been 23 emails sent to them and no refund given,I would not even rate this company. There is another way to try and get you money back from them and that is to contact your bank or credit card company fraud department. They will probably tell you to write to them explaining what has happened. Include as much information as possible like the threat they made to damage your credit score (the one I put in below) and also include there advert about no risk guarantee as follows. First of all, you will have to open a new account. Don’t worry; it’s not at all complicated and is completed in just a few minutes. That is where all payments will flow and where you can later also withdraw your earnings. As has already been explained in the journal, you only need to click briefly through a couple of questions. Simply click on this link in order to register. A window will now open in which you can make your first deposit. There you can choose how much money you would like to deposit. It is important that you know this: you are depositing the money with Bmillions, one of the largest Lottery brands. All payments are absolutely safe and disbursements are also processed as quickly as possible. You have to make up your own mind about how much you can or want to deposit. You are, in principle, investing money. The more you deposit, the more you will earn. We recommend a deposit of 100 euros, so that you will already be doubling your money within the very first day! The higher your deposit, the more money you can deploy as well. Now comes the most important point – choosing the right ticket. In our test, we have done exactly what Richard told us to do. We have only chosen tickets that have promised us an immediate return of at least 65%. That’s all you have to do. To Repeat: If you are not satisfied, then you will immediately receive your deposit paid back to you in full by Bmillions. You have nothing to lose! Hopefully if everyone does that it will bring Bmillions down along with their parent company Profit Ninja. Your bank / credit card company will investigate and return your money to you. Yes I have heard comments on here,I am having same problem,they said they are waiting for senior management to sort it out but what they don’t realise is that people won’t deposit like this and have nothing in return,they claim you can win all this money but it turns out that I deposited £150.00,they gave me 0.36p back,what a con that is considering a lot of my numbers come up and they never paid me,it’s apparently groups and syndicates,well I ain’t going to budge until I get my money back and they have stopped answering my emails,scammers. I took the plunge on Christmas Day, unfortunately before I read any reviews about BMillions. I was suckered in with their “Winners Reviews” claiming thousands over night and hundreds of thousands in a week. I also thought I would try them because they offered a guarantee of your money back if you were not happy and kept on mentioning I should have a go as no risk because of guarantee. Boxing Day arrived but none of the wins of thousands overnight were in my account. I immediately contacted them and asked for my Guaranteed refund they had promised. “We have received your refund request from our support department. Upon examination however, we have found your purchase to be valid and confirmed by matching your IP Address and credit card details. Should you be determined in your efforts to get a refund for a valid purchase you made, we will issue your refund. However as per our procedure in these cases our legal department will be in contact with your bank or credit card company and alert them about this behavior which may prove problematic for your credit rating and standing with your institution. I told them that if they do contact anyone to ruin my credit score they would find themselves in court. I gave them the copies they asked for and signed the form but changed parts of it mentioning their promises of big wins and guarantee of full refund and no risk. Then after 3 weeks of them saying they were waiting for management to update them. They asked again why I wanted a refund and then sent me the threat again and it has been going around in that circle since. In the next few days I am contacting WatchDog and Trades Description. I’ve told them I want my refund in full and also I want one of the big wins they promised I would get as compensation for their threats and wasting my time. I’ve said that I insist on the guaranteed refund whether or not. The big win they promised I’ve told them would stop me from going to WatchDog and Trades Description. No doubt about it they are a SCAM COMPANY. Yes I went through same thing,I had them threats exactly the way you put them about me insisting on a refund to fill out forms and I’d but never got my money back,I will be taking legal action against them if my money ain’t in this week. Why are these scams allowed on my website ?